The diplomatic tiff this week between Germany and Turkey is the same thorn bush that often entangles Western missionaries. 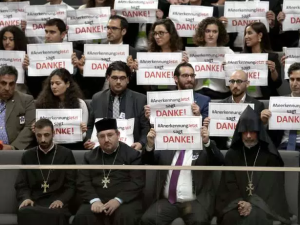 The German Parliament adopted a symbolic resolution declaring the killings of Armenians by Ottoman Turks in 1915 a “genocide.” The Ottomans killed over 1 million Armenians, fearing they as Christians would side with Russians. The government of Turkey has long resisted the “G” word, claiming the death count is exaggerated and was a normal part the war. But the response of the Turkish Prime Minister uncovers the real reason they resist the label “genocide”—shame. The Western applause of Germany’s resolution reveals contrasting cultural values—they did “the right thing” by confronting Turkey with the historical truths (even despite Turkey’s threat of damaged relationships). ignore the issue and act as if nothing happened. Westerners generally go with the first option—confront. They usually have a strong sense of personal conviction to speak “the truth.” But then comes the problem—that very action severs the relationship. Westerners may feel a strong inner conviction to confront, but what good is it if relationships end up worse than before because the other party is so disgraced? I believe there a third alternative besides “confront” or “ignore”—the option of “restoration.” The Bible also calls this “peacemaking” and “reconciliation.” There is a significant difference in Christian ethics between exposing the problem and fixing the problem, or between “doing the right thing” and “making things right.” Germany’s proposal allows the Armenians to feel vindicated for historic atrocities, but that does not restore the situation back to what is right. The practice of “restorative justice” addresses problems in a manner that honors and reconciles. For more, here are 3 ways to apply restorative justice and a short video of a concrete example. :), you missed one point, indeed one big political motivation behind the resolution—to shame Turkeys badly is for the sake of exposing the bad that is happening towards the Kurds currently. Knowing that there are good political forces in Turkey that Need Support and a voice. Validation (!!!) as a means to support and strengthen and give a voice to today’s victims and STOP the bad of the here and now. They, the Kurds of today, feel heard and have long waited to be. During WW1 there was reasoning like yours made – and time was lost and murder was going on. IT IS ABOUT THROWING YOURSELF INTO THE WHEEL as Bonhoeffer would have expressed it! My second home is in Turkey by the way. I speak Turkish, know both countrys. My grandparents are German. Just as a hint: What about you try to think a little more Bonhoeffer when it is about situation ethics…? But does Germany’s resolution help that situation, or make the Turkish military digs in deeper? <Whether it helps the situation? yes- it strengthens the Kurdish morale. And: it prepares the German population for action of any kind – or for the next refugee wave, from East Turkey. – Very much a message to the German population, raising awareness and readyness. I’m a faithful & thankful reader of your blogs, and mostly I do agree. On this item maybe you might consider also the aspect of the Armenian people and their suffering (until today). My question is: isn’t your view on shame solutions – comparing with Jesus’s one step to far? Shame solutions are very, very important, but it’s not the only way. Also they must be combined with other aspects of culture (truth – fear). Same story about the Papua people in Indonesia. It is obviously they are discriminated (to say the least) by government policy. Already hundereds of victims. And, no,the government can not be put to shame because of bad governmence. How long must Papua people (& the world countries) wait to confront the Indonesian government with the truth? Again, I do appreciate your views on shame and I work on it and teach on it, but there must be balance. That’s also the missional and ecumenical challenge for the togetherness of worldwide christian churches. God bless you. Kees, good question–how does truth fit into restoration and reconciliation? Well first of all, I am not a foreign policy guru, so I purposefully shied away from answering what Germany should have done. International relations is well beyond my paygrade! However, I just wanted to use the situation to point to a common inter-personal dilemma many Westerners face. So, my ideas are much more on the small scale of personal relationships. Yes truth must obviously be a part of bringing about reconciliation. But the actions of Germany (to pass a legal resolution) illustrate a common Western concept–justice is served when the truth is exposed, confronting with naked facts becomes the goal. However, I would put the emphasis slightly different—the aim is restoration, and thus historical truth along with shame and honor are instruments towards that end. Reconciliation does not mean ignoring truth, but situating in relational realties for God’s purposes. I personally try to always pursue the restorative peacemaking aspect of situations as the optimal outcome. I have found, however, that there is often a party who is absolutely resistant: they place retention of their own honor above all else, and refuse to allow anyone else’s honor. Their attitude is very much like the statement of the Turkish representative. This means there is no way forward for reconciliation. On the foreign policy side of the Turkey/Armenian matter, I think many people (and countries) feel the current Turkish government is in a similar situation and requires repeated direct confrontation by other governments. So, a nation’s actions ‘might’ be the same regardless of the Western/Eastern cultural difference; they might be following Jesus’ own practice that confrontation is sometimes the right thing to do, because it comes closest to making things right in this world? Thank you for this article. I much appreciate the topics about honor and shame and the implications on theology. I’d like to suggest a slightly different angle on the article “making peace like Jesus not Germany”, that suggests that the main issue about the genocide resolution is confrontational truth versus saving face and suggesting that saving a relationship is always most important. I am writing with the bias of being a German with a worldview that values truth and confrontation and I am very well aware that I am in great need to learn many things from my Eastern brothers and sisters concerning honor and shame and preserving face in relationships. Saving face in a relationship and honoring the other party is important. But the question is whose face needs to be saved? And does face need to be saved even when the motives of saving face are selfish and harmful to others? Does the face of those with whom the power lies, yet acting contrary to truth and freedom need to be saved? Or does face need to be kept with those who stand for truth and mercy? In order again to save face with an important political partner and saving a relationship by suppressing the truth would be very shameful. Love rejoices with the truth! Dear colleagues, that we were accomplice of an awful crime, must not mean that we today become accomplice of those who deny it….. The accounting for Shoah is the foundation of our democratic government…. It is time also for the accounting of other crimes done by the forerunner of today’s government of Germany….. Therefore I also want to explicitly mention the genocide of the Herero and Nama people. This genocide too, is waiting to be accounted for.